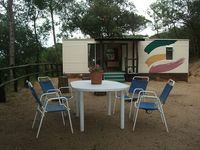 Properties in Maresme average 4.4 out of 5 stars. Town house 2 blocks from the beach. Ideal families. Property 5: Town house 2 blocks from the beach. Ideal families. Rural house with charm. Getaways of healthy rural tourism. Forest and sea. Property 6: Rural house with charm. Getaways of healthy rural tourism. Forest and sea. Holiday house near the beach, with garden and terrace. Property 30: Holiday house near the beach, with garden and terrace. Casa adosada frente del mar. Property 31: Casa adosada frente del mar. Un lugar acogedor, tranquilo...en medio de la naturaleza. Paloma, la anfitriona, nos explico lo que necesit&aacute;bamos saber de aquella zona, muy atenta y agradable. El amanecer, con mas de 60 burros, es muy bonito de ver. Recomiendo esa estancia si vas en busca de tranquilidad. Anna and her family are wonderful hosts who go out of their way to make your stay with them a memorable experience. Their property is charming, spotless, and comfortable. We loved our time there Be sure to get detailed directions as we had difficulty finding the home the first time. It is a short,easy drive into town but the town is very crowded during peak tourist season.